The Government's Cycle to Work scheme is a tax incentive offer aimed at encouraging PAYE employees to cycle to and from work. It started in 2009 and has contributed to a major boost in the number of people hopping on a saddle. According to the Central Statistics Office, the number of people cycling to work jumped by 43% between 2011 and 2016 to 56,837. Under the scheme employers can pay for bicycles and bicycle equipment for their employees and the employee pays back through what's known as a "salary sacrifice" arrangement of up to 12 months. Employees are not liable for tax, PRSI, levies or USC on their repayments. This essentially means any money you pay towards your bike will not be subject to any tax. The scheme covers the purchase of bicycles and equipment up to the value of €1,000 from approved suppliers and you can avail of the cycle to work scheme once in any five-year period. How do I go about getting a bike on the scheme? Contact your company's HR department - it is generally responsible for administering the scheme - to make sure your company is offering it. If not, there should be someone else or another department in your firm managing it. The first step is usually to find an eligible bicycle shop and obtain an official quote from them for a bike and relevant cycling equipment. The €1,000 limit applies to the bicycle as well as safety equipment. You can spend more than the limit, but if you do any amount above €1,000 will be treated as a benefit-in-kind income tax charge. Your employer pays the supplier upfront for the bicycle and sets up a 'salary sacrifice' arrangement from your salary over an agreed time frame (maximum of 12 months). This generally means that you visit the shop, select the equipment you wish to buy and have the shop invoice your employer directly for the cost. Sometimes you'll need to hand the invoice into your own company. The repayment for the bicycle and equipment is then deducted from your gross (pre-tax) salary. Deductions can be made weekly, fortnightly or monthly depending on your salary payment arrangement. Some companies may require you to repay the amount for the bicycle over a shorter period, e.g., three or six months. Companies use brokers (e.g. biketowork.ie, taxfreebicycles.com, etc.) to administer the scheme on their behalf. Generally you shouldn't need to deal with these companies at all and can go through your own employer. But it is good to know they exist as if you randomly happen across these brokers, it could lead to confusion otherwise. Once the broker has the invoice for the bicycle and equipment, they will approve it and provide you with a voucher, which you then need to give to the bike shop (this can usually simply be emailed). This can be the slowest part of the process and could take a number of weeks if you're unlucky, or just a matter of days if you are lucky. Once the bike shop has your voucher, it is usually prompt with the turnaround to get you on your bike. 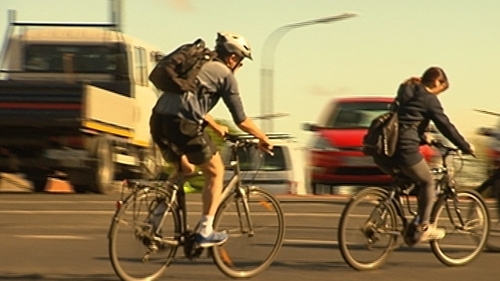 Do I have to use my bicycle to cycle to work? Technically, you must use the bicycle and safety equipment mainly for what are known as 'qualifying journeys'. This covers the whole or part (for example between home and train station) of a journey between your home and your normal place of work. Your employer does not have to monitor your bike use but you will be asked to sign a statement saying that the bicycle is for your own use and will be mainly used for 'qualifying journeys'. There is nothing to stop you using the bike for other non-work journeys also and it's not likely you will be quizzed on whether or not you are actually using your bike to travel to and from work. How much can I save on the cost of the bike and equipment? The maximum saving that can be made under the cycle-to-work scheme is €495. If you earn a gross salary below €33,800, then the most you can save (i.e., if you spend the full €1,000 on a bike and equipment) is €295. For anyone earning €33,800 or above the maximum saving rises to €495. There are numerous online calculators, such as this one where you can work out your exact saving depending on how much you plan to spend. You can only avail of the scheme once every five years, so it makes sense - if you are in a position to do so - to spend the entire €1,000 limit. The chances are you could do with spending that much anyway and you are essentially saving nearly half of the cost on the items you buy. Investing in a lock, or multiple locks, is also a prudent move. Unfortunately, the boom in the number of bicycles on the road has been matched by a rise in bike thefts. Spending money on a decent lock is definitely a must and using them properly is also strongly advised. If you're new to cycling and are starting out on the roads, you might notice that the infrastructure for cyclists still has some way to go. In some places on roads the gap between cars/buses and your bike is far smaller than you'd like. To get used to this, it might be easier and safer to start out on a quiet weekend day for traffic and get to the grips with the road that way. Also, when purchasing equipment, don't be afraid to negotiate with the bike shop and try and secure a discount where you can. Don't just accept standard prices on offer - remember, while you might not be paying the full amount of the bike and equipment, the shop will receive it and that's a decent amount of money! And if you're a regular driver you'll be saving on the double - with lower fuel costs, a fitter body, and you won't lose your mind anywhere near the same amount by getting stuck in traffic.